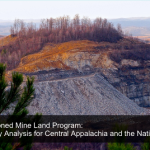 In 2013, federal funds derived from a per-ton fee on mined coal were distributed to Central Appalachia states for restoring abandoned mine lands. The result was $182 million in economic benefit and 1,317 jobs–plus cleaner streams, and a healthier future for nearby residents. A new report out shows how the federal program should be fixed to yield even better results, and sooner.